PEXA or Paperless Examinations Advantage is a secure ecosystem consisting of customised software and purpose-built hardware. This ecosystem includes a specially developed secure software system and services in the cloud, making it an end-to-end solution for students, faculty and administrators. Biometrics restricts access and prevents impersonation. 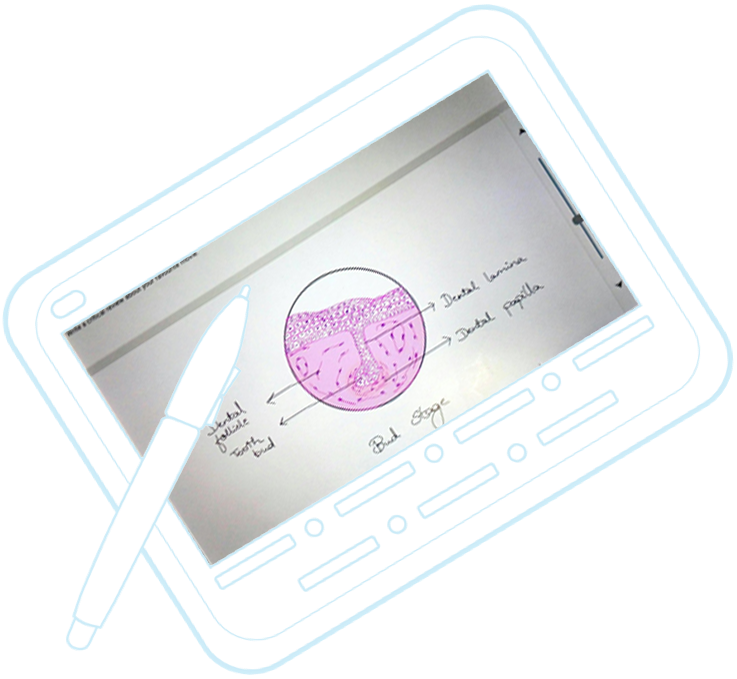 DigiTaal, our state-of-art hardware is a proven device that allows students to write descriptive examinations just like they would do on paper with a pen. Developed after several years of intensive research and testing, DigiTaal is a purpose-built device that allows long examinations to be written using integrated tools such as calculators, finely calibrated geometric instruments, different kinds of ‘papers’ – plain, ruled and graph. It also allows you to use multimedia and other rich content in your exam questions. With the PEXA+DigiTaal Ecosystem, the entire process of conducting an exam, right from authoring questions, delivering the exams, evaluating the responses and declaring results can be accomplished digitally, thereby eliminating the necessity of paper in the entire process. It also removes the most common challenges with administering physical, paper-pen descriptive examinations, while providing a highly secure and scalable solution that provides a host of unique benefits. The PEXA Ecosystem provides you with the capability to make your examination process totally paperless. So Many Problems - Just One Solution! The continued use of paper is very inefficient and has the ever-present risk of challenges around security and transparency. Institutions have to go to great lengths to ensure their examinations meet the highest standards of internal and public scrutiny and are always fair and just to students and faculty alike. lengthy and complex from question paper setting to declaration of results. paper leaks, candidate impersonation and cheating. Conducting examinations in a secure and efficient manner is a core aspect of any university or college. However, this is easier said than done. Most examinations do not continue to be on paper by choice. Even today, hand writing and drawing are necessary and typing or online examinations are not viable options in most situations. The continued use of paper is very inefficient and has the ever-present risk around security and transparency. Institutions have to go to great lengths to ensure their examinations meet the highest standards of internal and public scrutiny and are always fair and just to faculty and students alike. Most examination administrators are very happy to move to a paperless format if possible and faculty and students are always happy to support such a move. The PEXA Ecosystem solves a number of challenges currently faced by examination authorities. Logistics for question papers and answer scripts, specially where exams are over a number of centres spread out over a large area. Evaluation – Fast turnaround and ease of evaluation from anywhere and transparency in assessment. Disputes over evaluation and reassessment. These are real challenges for which there have been no solutions till now. Yet, they can cause serious problems including dissatisfaction among faculty and students, bad publicity, reputation impact and legal disputes. The PEXA Ecosystem addresses these challenges with ease and elegance. Also, since the experience for students is very similar to writing on paper, students find it easy and adapt quickly to writing on the DigiTaal device. What’s more, using this system requires very little change in any current processes that are in use and can be mapped on to the system very effectively and fast. In the end, what you have with the PEXA Ecosystem is an end-to-end paperless examination solution that works! The PEXA Ecosystem has been created as a dedicated solution to help you transform the entire examinations process forever. Whether you are an administrator, a teacher, a proctor, an evaluator or a student, the PEXA Ecosystem will have you sailing through the entire process with efficiency, security and speed like never before. With Digitaal’s biometric and built-in stealth mechanisms you don’t need to prepare time-consuming processes and double-check test-takers. Also, whenever there are any doubts about the integrity of the test taker, all you need to do is analyze their digital footprint with the audit trail created in the system! No longer worry about transportation and logistics or the risk of security breaches and leaks, of loss or damage of the question paper or answer script during transit. With the Littlemore System, you don’t need internet connectivity, AC Power, LAN Cables and power backups while conducting your examinations. You can go right ahead and conduct examinations as you would do on paper.No last minute rush to print question papers! What’s more, now you have a real and practical solution to expand the reach of your college or university without worrying about examination logistics. The positive impact you will start leaving on the environment when your examinations go paperless is immeasurable. Each year, you could potentially prevent the loss of small forests with the paper you save. Your institution can lead the way to a greener world for future generations. Paper has been used for centuries and for a good reason. Till now, it was the only practical way to conduct examinations at scale. Also, its so easy to use. Just pick up the answer script, flip through the question paper, and start writing. It’s worked for centuries and billions of test-takers. The Littlemore System’s user interface is designed to offer as close to the same experience as with paper. DigiTaal is ergonomically designed to keep the complexity out of writing examinations on a device, the menu interfaces are designed to keep the navigation intuitive. It also has quite a few features, blending the tried-and-true with an appropriate twenty-first century experience.